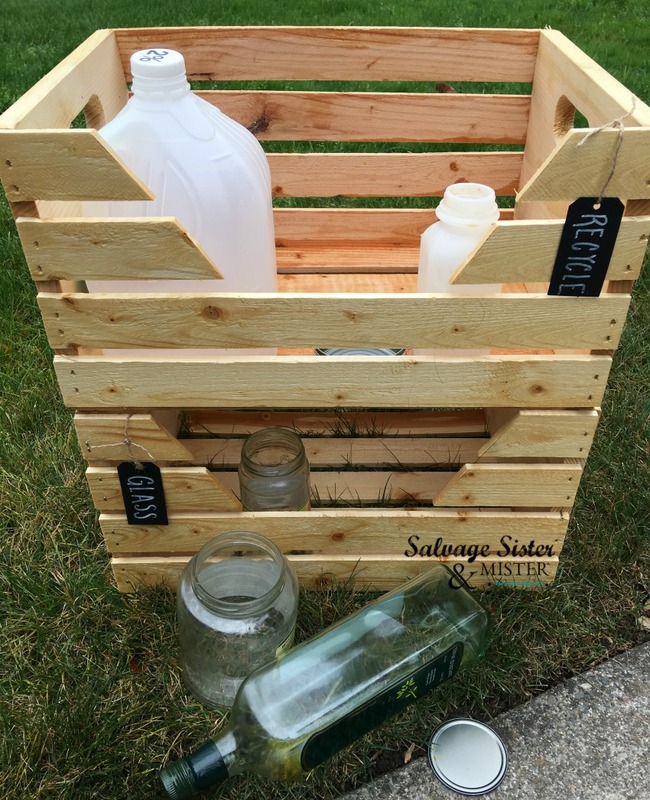 With a name like Salvage Sister & Mister we HAVE to recycle, right? Unfortunately, there has been some major changes to the recycling processing in the last year. Have you seen it in your area as well? Basically, a lot of the recycling was being sold overseas and now…not so much. If you want to read more about it, you can go here. What does that mean for the average home? 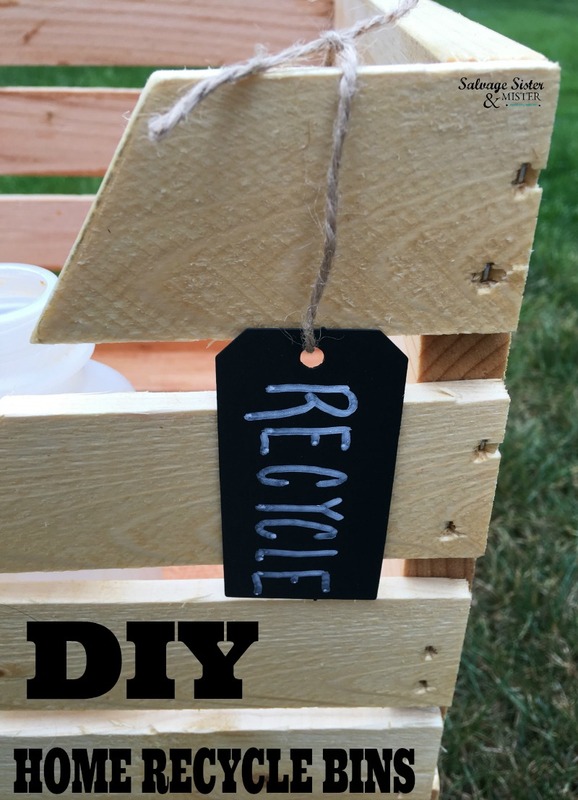 Well, reducing and reusing have always been a better choice, like this reuse project for cardboard “pallet” garland, but they are even more so now. And when you do recycle follow your cities guidelines on what can, and can not, be recycled. Prior to this change, we were able to throw all of our recycling in one bin. In our city, as in many others, we can no longer do that. Many items can’t be recycled or have to go to a separate facility….like glass. To comply with these changes, we created some home recycling bins to separate the items out. You can make yours to fit the requirements in your area. *We do use affiliate links to show the same or similar items used. We could recieve a small commission if purchased to keep our content free. You can read our full disclosure policy here. Paint or Stain, if desired. 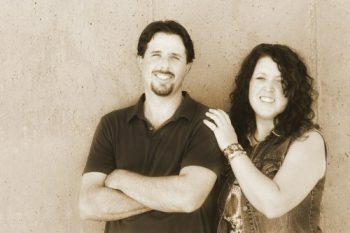 Here’s what we used on this project. Lava Soap, Click here to find where to purchase. You can also download a money-saving coupon for your next shopping trip. With a pencil, mark the wood crates where you would like to cut the openings. Using a hacksaw, carefully saw the pieces off. TIP– When you cut one side the other side will be a little harder to manage and not have much strength so be cautious. You can also saw part of the way on all sides, without cutting completely through so there’s a little more holding it together. Sand any rough edges to avoid splinters and make it easier to stain. 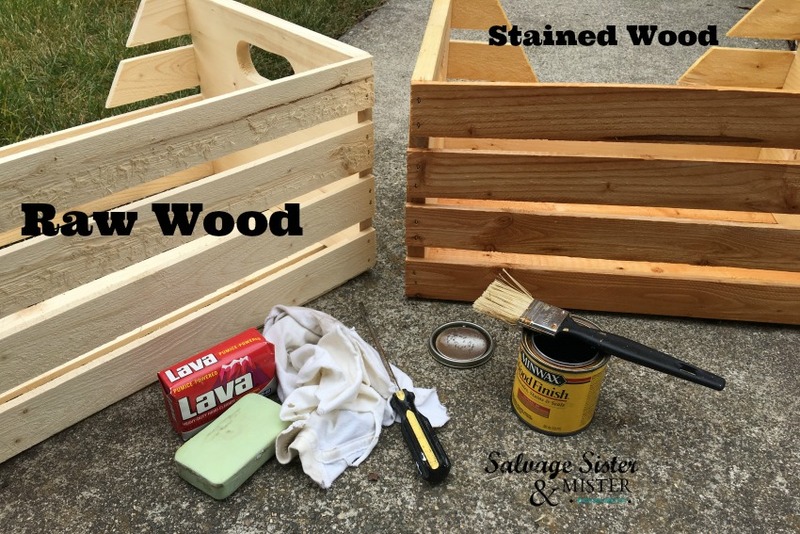 In a well ventilated area, stain/paint the crates as you like. 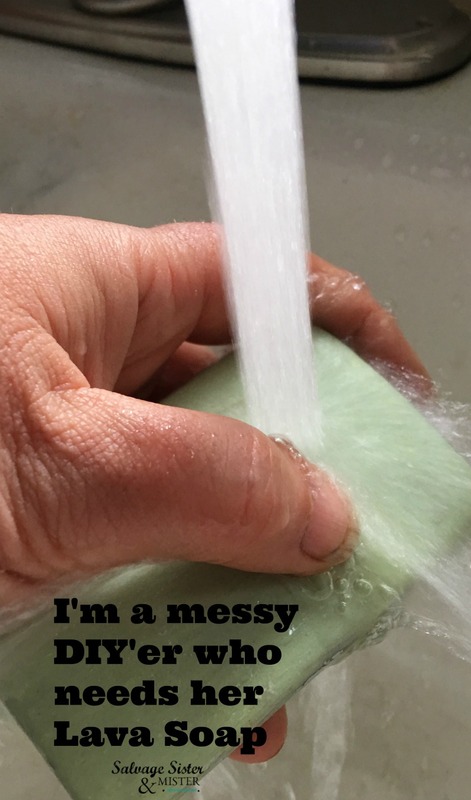 If you are like a certain Salvage Sister, wash up with Lava Soap to remove any of the paint/stain you have on your hands. Add the desired tags for your home recycle bins. Note – Since these will need to be separated each week, nothing was done to attach them. Now, when the home recycle items need to go to our large bin, we can just take the entire container outside. And, when we need to take the glass to the local collection spot, we can also just grab it. Has your community changed it’s recycling process? We would love to hear about it. Feel free to share in the comments below. And don’t forget to visit the Lava Soap Facebook page to learn more about this amazing pumice product and all the ways it remove grease, grime, and other substances from skin (which every DIY’er needs). 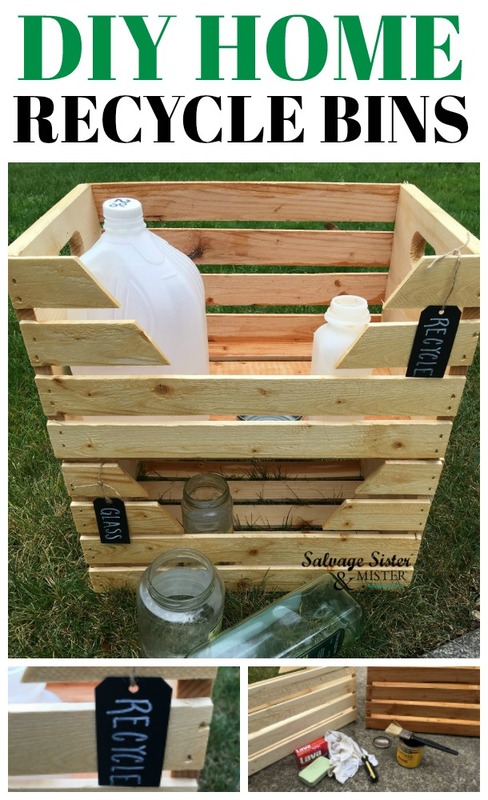 Your recycling bins aren’t only practical…they are so chic! I love things like this. Also, LAVA soap…oh my word! I remember this from when I was a kid. It was always on the laundry tub. My Dad built our house and he was always DIYing something, building something, working on something and the only thing he ever used to get off all the grime was LAVA soap. You brought back some great memories for me and also reminded me to buy some for my laundry tub. I had honestly forgotten all about it. Oh how I wish the recycling bug would bite here in South Africa. It’s just not something people do. Well that’s not completely true. There are few eco estates, where the super rich live that have recycling areas, but that’s about it. Quite sad actually. We have to drive for miles to find a glass recycle bin and plastic bottles are a totally different story. On the day that put the garbage out there are really poor people who come around and dig in the bins for the empty bottles. Most people chase them away, because they’re not always careful and leave the rubbish outside the bin. I think they’re great and would love to know what they do with all that plastic. They cart it away on these large hamper basket styled things with wheels on them. All hand made by the way. It’s quite a sight. They push them up and down in the middle of the road causing huge traffic jams. I have to make a plan one day and ask if I can take a picture to share. Sorry and here I am waffeling away. Love your idea Deborah. They look so pretty and would work great as veggie baskets too. I love these recycling bins! We don’t have a way to sort our stuff so I need something like this.